Young Atlantans gathered for a Purim party at Midtown’s Bocado sponsored by YJP on Saturday, March 11. 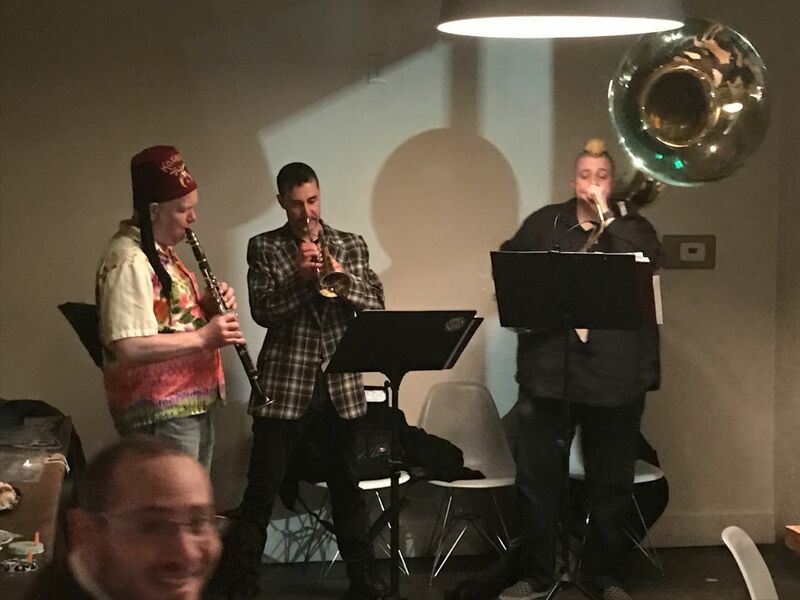 A jazz band provides the music for the YJP Purim party. 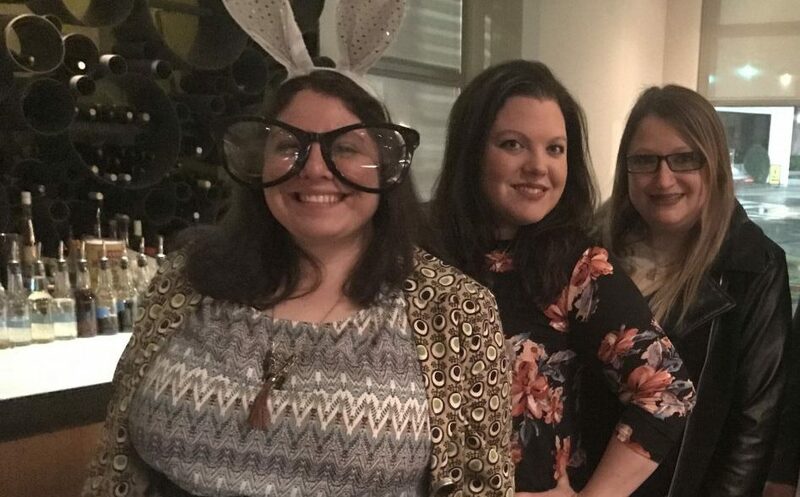 Young Atlantans gathered for a Purim party at Midtown’s Bocado that was sponsored by Chabad’s young adult sector, YJP, on Saturday night, March 11. I haven’t been to many of these events. To be honest, it’s because YJP is affiliated with an Orthodox organization, and I’ve often wondered how I’d be received in a crowd like that as a Reform Jew. Going into these events without knowing anyone in the Orthodox community and without knowledge of some of the more religious traditions gives me shpilkes. Sitting at the bar, nursing a drink before the event began, I was surprised at how many people came to introduce themselves — Orthodox, Conservative, Reform and not religious. I also noticed a crowd around the private room once the event began. People from the restaurant wandered over, were given groggers and stayed for the explanation of why we use them on Purim. Everyone was clearly welcome. 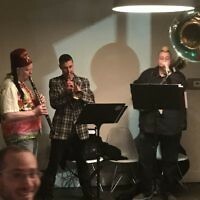 I met quite a few people for whom the party was their first Jewish event in Atlanta, some who go to YJP events regularly, and even more who attend various events sporadically and just heard there was a Purim party in Midtown. 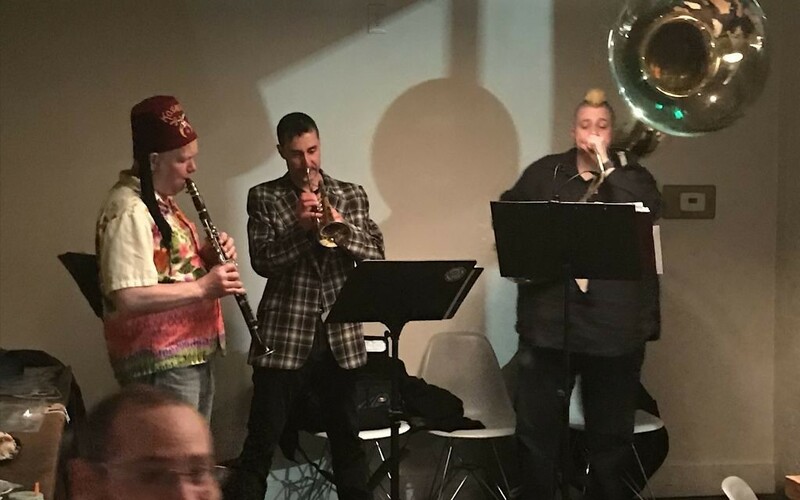 Many dressed for the occasion in costumes and noshed on hamantaschen while listening to the band providing jazz for the evening. At first glance, this might have seemed like any young adult event in the city, Jewish or not. Introductions were made, drinks ordered, and phone numbers exchanged. 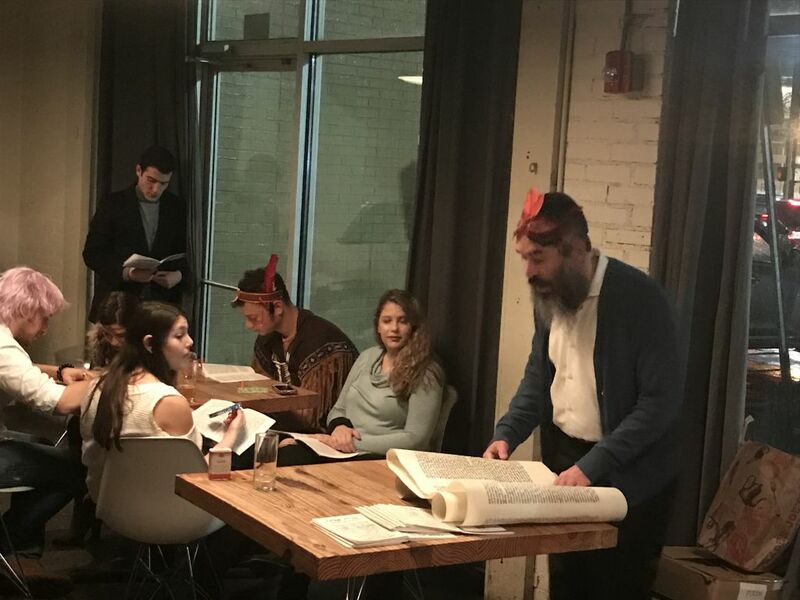 However, this Purim party was a YJP event, and there were perhaps more religious elements than your typical Reform or even Conservative event. Chabad Intown Rabbi Eliyahu Schusterman read from the Megillah. There was discussion about what Purim means for the Jewish people. And many participants were rather conservatively dressed for a Saturday night out in the city. I realize many Jewish young adults are easily scared off by the mention of more religious elements. So many of us are just Jew-ish, right? A bagel with cream cheese and knowledge of some Yiddish terms suffice. 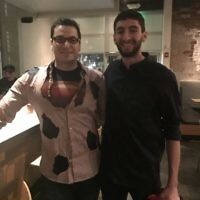 While I don’t think I’ll be attending Chabad events weekly, I have to be honest and say it was refreshing, even for a night, to connect with some tradition. 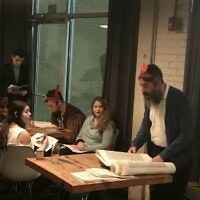 Who knew that it could be found on a Saturday night at a bar in Midtown with a rabbi, some silly costumes and a number of other young Jews seeking the same things? Rabbi Eliyahu Schusterman reads from the Megillah. 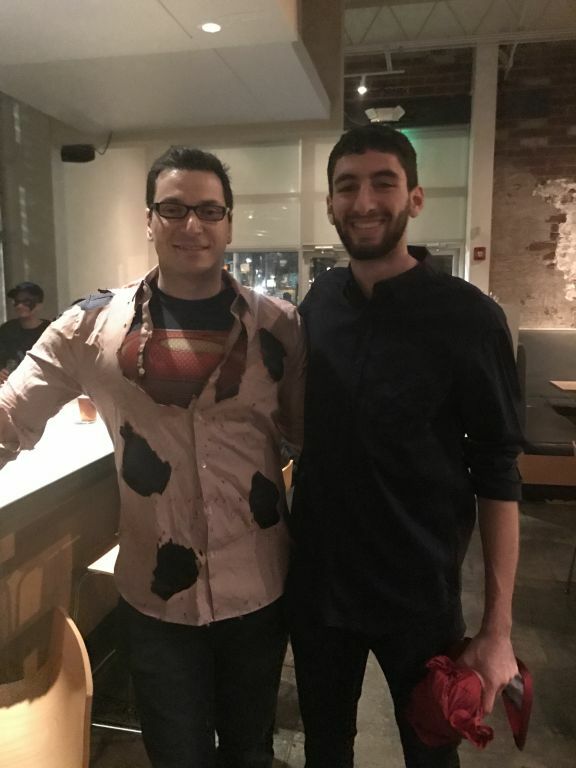 Michael Brainin (left) and Gilad Doron attend the YJP Purim party to meet other young Jewish professionals. 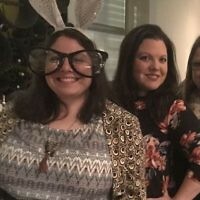 (From left) Ruthie Be, Faye Grossblatt and Rachael Jacobson show off their Purim costumes at the bar at Bocado.